“She is… the Sky Sword…” Red Lotus only needed to take a step forward, then she would be able to ignite Yun Xi with the Red Lotus Holy Sword in her hand. However, she stopped and looked at the little girl with a weird white mask. 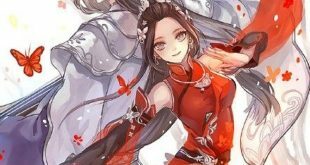 “Shaya Longnis… the Sky Sword…” On the ground, Hua Huo also stopped and raised her head, gazing at the little girl floating in the sky. Sky Sword was a supreme title in the Sky Sword God’s Domain. They were the legends of this sword domain, they were the most famously strong beings in the universe. Shaya Longnis was said to be the strongest one amongst all the young Sky Swords. Although she was just the 10th Sky Sword, her power was the strongest apart from the three Deicide Sky Sword. Her true body was a slime, but she could turn into various forms, and all forms were from the creatures it had swallowed. At this moment, this female human form was one of Shaya Longnis’ avatars. “I’m in. Finally, I’ve arrived in this world!” The Sky Sword took over the Dark Shadow Spider Queen’s body, so that her will could cross the barrier of this world. Under her mask, she was smiling happily. “Give me it, the most precious treasure in this world.” Her slender finger pointed at the Island of Mist and waved casually. “Hiss!” As if the island was butter and her finger was a knife, the whole island was divided into two under her finger. The island, the sea, and the thick bedrock under the sea were all torn open under the Sky Sword’s great power. A great long scar appeared, which was utterly shocking and ugly. Scorching magma gushed out of the scar onto the ground, flash heating the water to steam as more and more water flowed into the crack. The magma and steam quickly destroyed the whole island. Infinite volcanic ashes floated in the air. All mists had disappeared, and the Island of Mist had almost been destroyed. The ground was groaning, and the sky was crying. The whole island boiled like a scene from doomsday. One finger. She just pointed one of her fingers at the island, then the whole island was destroyed. It was the purest and simplest power! “Don’t you want to appear? Well, I don’t mind if I do it again.” Looking at the island, Shaya Longnis pointed at the island and waved her hand again. Another scar of the ground appeared on the island, forming a cross with the previous scar on the ground. One fountain of magma after another erupted into the sky. Finally, the Island of Mist was erased from the map of the Water God’s world, and Shaya Longnis just moved her finger twice. We are not at the same level! Yun Xi pinched the green slime bracelet subconsciously as sweat broke out all over his body. When he really witnessed the power of the legend rank, he realized that the hero rank was nothing in front of the Sky Sword! Erasing the Island of Mist couldn’t even be counted as a warm up exercise to Shaya Longnis. It was just a stretching exercise to her. Only a legend ranked being can defeat another legend ranked being! Even though the little girl here was just an avatar, a small part of the real Shaya Longnis! “I’m waiting for an answer.” Suddenly, from the Water God’s Opera House, an old voice echoed between the sky and earth. It was the only and everlasting god of this world, Water God. “Answer? Don’t be perfunctory to me! I will never forget ‘that thing’. I will never forgive you.” Through the mask, Shaya Longnis’ crimson pupils became ferocious. The Water God hesitated for a while. Apparently, the Water God and the Sky Sword had a history in the past. Yun Xi’s heart suddenly pounded. He vaguely realized that the answer was related to him. After coming to this world, he was given the most special quest in this world. “Ok, you have one minute.” Shaya Longnis smiled cruelly. She had determined that no matter what the answer was, the fate of this world wouldn’t be changed. “Shaya, you changed after obtaining this human body.” Water God’s voice sounded surprised. “Because I like this human, therefore, after I ate her, I inherited a few of her compassions, so I can wait for you for a minute.” Shaya Longnis touched her mask. The original Child of Slimes, when she hadn’t yet obtained the name “Shaya Longnis”, was a more brutal and dangerous monster. At that time, she was still an irascible object whose goal was to swallow all beings in the universe. Till it fell in love with a girl and was rejected by her, it ate the girl, then it obtained its human form and human intelligence. After that, it became even more dangerous. “Don’t pretend, didn’t you also eat this world?” Shaya Longnis raised her lips and spoke the truth that made Yun Xi feel chilly all over his body.